Demarest captured the meet-concluding 4x400-meter relay to edge Ramsey for the girls title, and the River Dell won its third title in the past four years at Friday's NJSIAA North Jersey, Sec. 1 Group 2 Championships at the Bennett Center in Toms River. Heading into the 4x400 relay in the girls competition, Ramsey led with 48 points, Demarest had 45, and River Dell had 44. Demarest's foursome of Ashley Constantine, Breeana Nolan, Kyra Pialtos and Alexa Cruz came through in the clutch, winning the relay in 4:10.94 to win the team title in dramatic fashion with 55 points. Ramsey was third in the relay to finish in the team standings with 54, and River Dell, which was bidding for its fifth straight title, was second in the relay and third in the standings with 52 point. Demarest received several strong performances and racked up 32 of its 55 points in the field on the way to the championship. Sydney Woods, the state leader in the pole vault, won that event for Demarest by clearing a meet record-tying 12-0. In the shot put, Demarest junior Jada Sewell broke the NJ. Sec. 1 Group 3 record when she unloaded a NJ#3 and PR of 41-10,. Also in the shot, Bella Sposato (37-11 1/4) and Julietta Ambartsoumian (32-8) went 2-4 for Demarest. In the boys competition, River Dell finished on top with just 44 points, the lowest winning total in the history of the North 1 sectional. Eight of the 15 teams scored at least 20 points. Manchester Regional took second with 32. Mahwah was third with 30 and Lakeland placed fourth with 28. Andrew Sanchez led the charge for River Dell. The senior won the 400 in 51.67 and ran on the winning 4x400 (3:34.07). 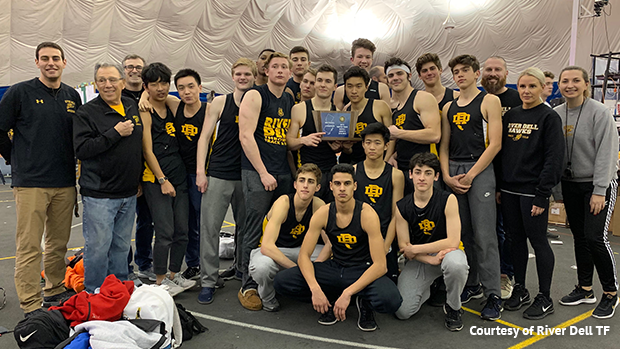 Also for River Dell, Jon Fontana was second in the 3,200 and fourth in the 1,600, Ed Ahn was fifth in the 55 dash, sixth in the 400, and ran on the winning relay. Joshua Iyonsi was fourth in the shot put, Everett Reilly took fifth in the hurdles, Griffin Milgram was fifth in the shot, Aaron Furneaux placed sixth in the dash, and David Gibbons and David Puentes ran on the 4x400. In other highlights, Indian Hills senior Bobby Oehrlein won the boys 1,600 (4:28.26) and 3,200 titles (9:47.88). River Dell twins Maggie and Amanda Mircovich traded places and victories. The sophomores went 1-2 in the 1,600 and 800. Maggie won the the mile in 5:14.56 with Amanda second in 5:14.67. In the 800, Amanda was first in 2:25.95, and Maggie placed second in 2:26.01.